After deciding to completely whitewash a British Medical Journal study linking 120,000 excess deaths with Tory austerity dogma just a few weeks ago (because the BMJ are supposedly not a reliable enough source), the BBC decided to give the sneering Tory fanatic Toby Young a platform to spew a load of anti-Labour bile on the Sunday Politics show. 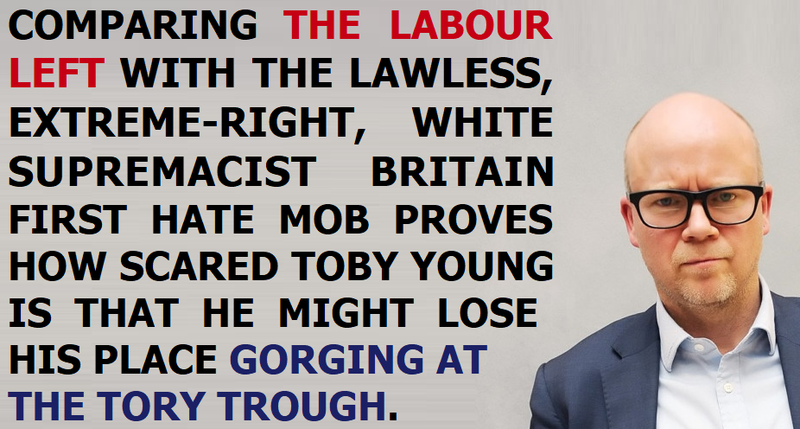 You may remember Toby Young as the hard-right Tory propagandist who led the Tories for Corbyn campaign in 2015 under the spectacularly misguided delusion that a genuinely left-wing Labour leader would destroy the Labour Party and create a permanent Tory hegemony. Young doesn't seem to have acknowledged his own idiocy in actively promoting Jeremy Corbyn, and neither has he learned the lesson from the 2017 General Election that hyperbolic anti-Labour smears simply don't work anymore. Young's latest hyperbolic propaganda attack against the Labour left is to compare the grassroots Labour campaign group Momentum with the Britain First hate mob. Britain First is a disgusting extreme-right BNP splinter group led by a bunch of criminals with multiple convictions for crimes like harassment, criminal damage, and assault, and in June 2016 one of their supporters brutally murdered the MP Jo Cox. Momentum is a democratic socialist campaign group within the Labour Party that supports Jeremy Corbyn's leadership, and works to promote greater democratic participation. Britain First have announced all kinds of policies over they years, including extrajudicial lynch mob killings, the introduction of systematic government discrimination in favour of white British people, book-banning, a total ban on abortion regardless of circumstances, the abolition of the right to a fair trial, compulsory Christian indoctrination in schools, the deportation of all refugees, government control of the media, a ban on all Muslims from holding public office, withdrawal from the United Nations and NATO, forced labour schemes, an Orwellian ban on the use of the word "racism", restoration of the death penalty, compulsory national service, an expansion in the sell off of social housing, imitation of Tory austerity dogma, and "repatriation" of British-born people of foreign descent. Britain First's political tactics involve spreading anti-Muslim, anti-immigrant, white supremacist, and anti-intellectual propaganda on social media; providing social media echo chambers for their followers to spread hatred, yearn for fascism, and plot criminal activities; street patrols and mosque invasions; conning donations out of unsuspecting people with honey trap scams like pretending to raise funds for animal welfare issues; turning a murdered British serviceman into a poster boy for an extreme-right ideology his family say he would have abhorred; and ripping off the poppy logo from the Royal British Legion in order to raise funds for their own extremist party. Momentum support the centre-left policies outlined in the Labour Party manifesto. These include running essential British infrastructure and services (the NHS, Royal Mail, railways, water companies, national grid) as not-for-profit public services; the establishment of a National Investment Bank; treating education as a right that is beneficial to all of society, not a commodity to be sold at the highest possible price; curbs on tax-dodging and excessive boardroom pay; a £10 minimum wage; an end to the systematic abuse of disabled people in the welfare system; and the replacement of ruinous Tory austerity dogma with a sensible investment-based economic strategy. Aside from supporting the Labour Party manifesto, Momentum also aim to encourage greater political participation and to democratise the Labour Party from within, giving much more power to ordinary Labour members. So on the one hand you've got a neo-fascist, ultra-nationalist, extreme-right, white supremacist political party with a load of bonkers policies ranging from outright racism and zealotry to keeping the worst elements of Tory fanaticism as they are (austerity dogma, the destruction of social housing, welfare cuts ...), that is run by a bunch of criminals, and supported by a vast online hate mob who openly yearn for fascism and praise acts of extreme-right terrorism. And on the other hand you've got a group of 23,000 law-abiding citizens from all ages, races and walks of life who promote centre-left economic policies that are commonplace across Europe and the developed world, and work to make the Labour Party more democratic and responsive to the will of its members. The reason Toby Young wants you to equate this kind of peaceful centre-left democratic socialism with a lawless extreme-right hate mob is that he's one of the big personal beneficiaries of right-wing Tory ideological dogma. In a spat with the left-wing political commentator Owen Jones over his absurd Momentum/Britain First comparison Young actually patted himself on the back about having set up free schools and bagged a job working as a director of a pseudo-charity called New Schools Network which is designed to siphon cash out of the taxpayer funded education budget in order to stuff it into the pockets of a bunch of "directors" and "advisers" in the form of bloated salaries and advisory fees. 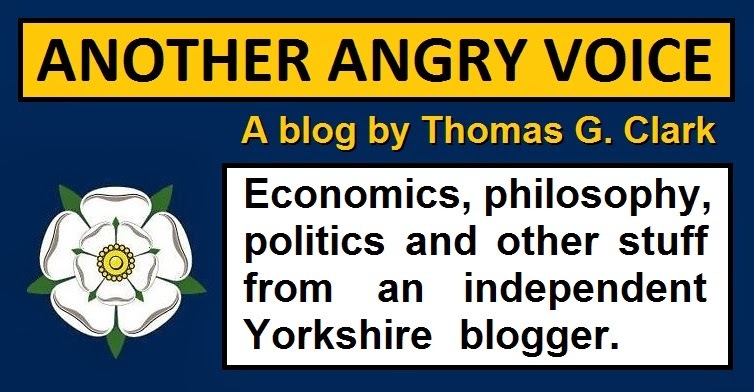 Aside from topslicing cash out of the education budget, Young also earns a pretty penny working as a Tory propagandist for the tax-dodging Barclay Brothers, so he's definitely a man who knows which side his bread is buttered. Young knows that a democratic socialist government would present a grave risk to parasites like him who gorge themselves on state funds whilst pretending to love capitalism so much. Jeremy Corbyn has pledged to reverse the incremental privatisation of the NHS, establish a National Education Service, and to take heavily-subsidised national industries out of the hands of exploitative private sector profiteers and run them as not-for-profit public services. This not-for-profit agenda strikes terror into the hearts of Toby and his ilk who believe that they have a God-given right to use government budgets to enrich themselves and their cronies, and to milk the British people for every penny they're worth through exploitative employment practices, rip-off private sector utilities, and the virtually unregulated private sector rental market. These people are so used to enriching themselves at everyone else's expense that the prospect of more democracy, not-for-profit public services, and a clamp down on tax-dodging seems even more extreme to them than the wanton street thuggery, abolition of women's reproductive rights, state control of the media, religious indoctrination in schools, extrajudicial lynch-mob killings, white supremacism, and all of the other depraved stuff that Britain First promote. Toby Young and his ilk are nothing more than frightened piggies at the Tory trough, and they're absolutely terrified that a rejuvenated and democratised Labour Party led by Jeremy Corbyn might actually hinder their absolute gluttony at the expense of the rest of us.